I have a Mac Pro with OS 10.5.8 software. I have a problem with printing. The printing dialogue box does not give me the option of printing in black and white. It only gives me 'standared, last used setting and Save as... options. I can not find the Printing Utility in the Utilities folder. I have reinstalled the Samsung colour laser printer software - no joy. Would you have a suggestion what I could do? Can you do the following to be able to show us your print dialog box? 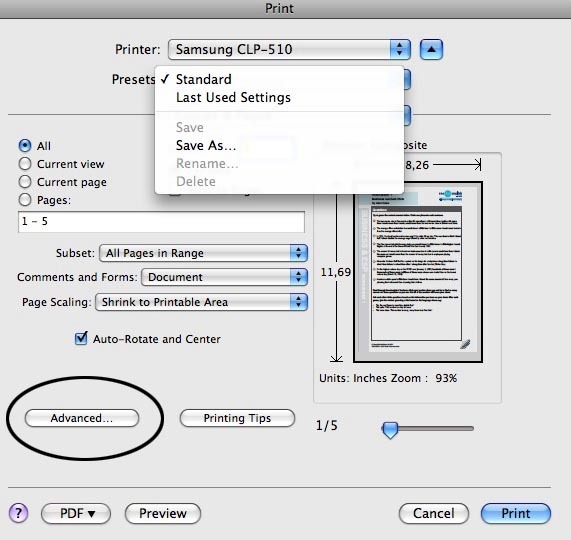 1) Open a document, and go to File / Print to bring up the print dialog box for your printer. 2) Press the following 3 keys at the same time (Command, Shift, and 4). This will create a crosshair on your curser. 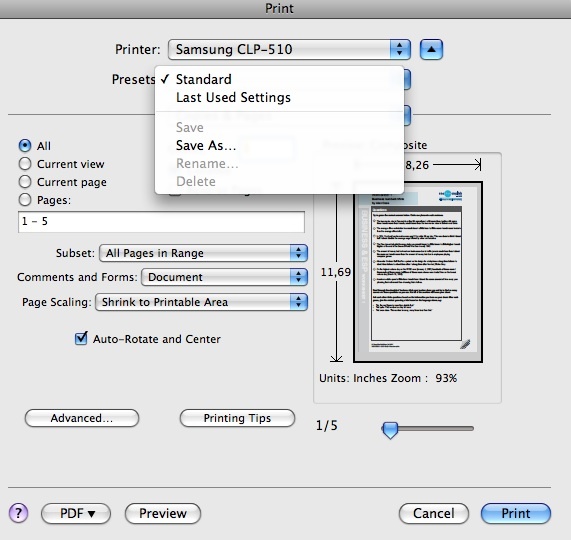 3) Drag a box around the print dialog box and let go of the mouse button. This will save a jpeg file to your desktop of what you just highlighted. 4) Insert that jpeg file into your post by going to the "Tree" icon at the top of your input field and selecting the jpeg to place. Have you deleted the printer from the System Preferences / Print & Fax and re-added it? It is possible that i deleted the printer. It has not been working for a while, so I don't remember. Can you convert the png file to jpeg and repost it to the thread? We are unable to view png files. I forgot that the defaul image capture format is png. If you can't convert png to jpeg, you can change the defaul capture format in Terminal with a single line of text, if you prefer. Please let me know. Also, if you think it is possible that you have deleted the printer in System Preferences, I would go back to System Preferences / Print & Fax and make sure the printer is there. Highlight it on the left and relay back here what it states under "kind" on the right side of the window. When you place the graphic in the post, you have to "Browse" then insert. You can't Link to the graphic unless it is hosted online instead of in your computer. The pdf format will work, it just needs to be inserted rather than linked. Were you able to check to see if it is properly installed and if so, what was listed under "kind"? I do not understand what you mean by "have to "Browse" the PDF. I also don't know what you mean by "4) Insert that jpeg file into your post by going to the "Tree" icon at the top of your input" I tried to attach the JPEG images into the browser I don;t know if I did the right thing. I use 3 printers at work. None of them appears in the 'add printer box' or under 'kind'. The work printers are only black and white printers. 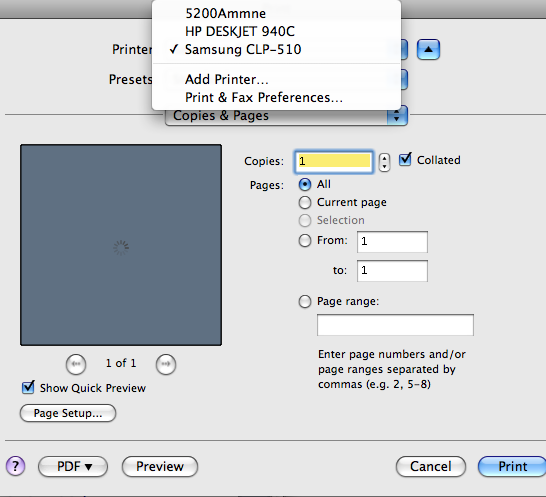 My printer is Samsung CLP-510. I have reinstalled the printer following the instructions but nothing has changed. I can not find the printer utility folder to check the situation. Find the file, click Ok in this window, then click Insert in the first window. It should place the pdf right into the text field. 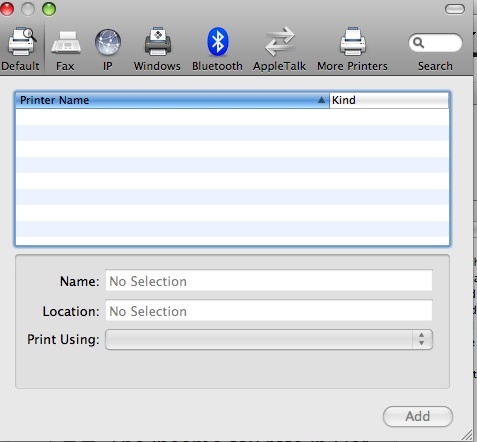 When you go to System Preferences, then click on the Print & Fax tab, there should be a button at the bottom of a + symbol. If it is grayed out, then you may have to unlock the page (the lock symbol in the bottom left corner). You would first have to click the + button then in the next popup window it should show all of the printers on the network. Let me know if you are able to get this far. The first problem is that I am not using Forefox. I am using Safari. I only said that I could use Firefox. I did go to printer and Fax preferences but the + is not greyed out. OK I have got it in Firefox. Hey, we're getting somewhere! Firefox must have been the issue on adding the images. You obviously have the printers added correctly. I can see them in the dropdown. When you select the Samsung and then press the "Advanced" button shown, what pops up? I have managed to sort it out myself. Thank you for your suggestions. Glad it worked out for you. Sorry I wasn't able to help. If you do have any more questions, please let me know. I wish you all the best, XXXXX XXXXX sure you can do a very good job. I will return to Justanswer.Mac! Hello - I posted a question earlier but somehow got cut off.